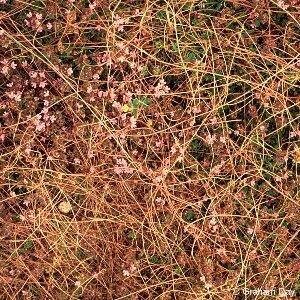 Dodder is a member of the same family as the bindweeds or convolvulus, but is parasitic, has virtually no leaves and only tiny flowers. It can be found occasionally growing as a parasite of thyme, restharrow, birds'-foot trefoil, whin, and other plants, but is very rare. 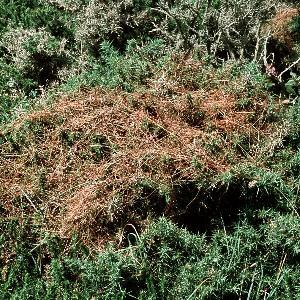 In appearance it resembles lengths of thin string twining over the host shrub. Occasional on sand dunes around the coast. All names: Cuscuta epithymum (L.) L.; Cuscuta trifolii Bab.